A longstanding favorite of The West Virginia Photo Booth Company is The Huntington Museum of Art – a gem of culture here in Huntington, supported by and managed day to day by superb people. Every year, I highly anticipate finding out the Museum Ball’s theme! When I heard “Under the Sea,” I was indeed over the moon! For those of you who don’t know, propping is one of my very favorite activities on this planet! 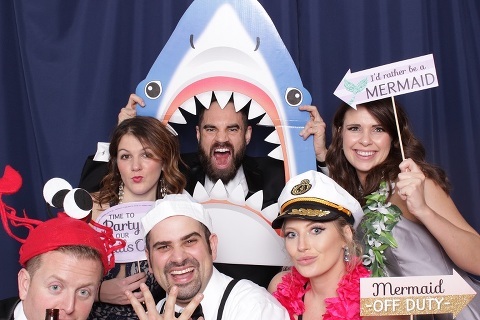 I spent months collecting random goodies for this night – the tie dye squid, various sharks with lovely chompers, mermaid signage (no girl should photo booth without proper mermaid flair! ), and a last minute random find was our delightful lobster, Lamar (Google Lamar’s name and you will find that in French it means “Under the Sea!”) An incredible evening!!! Special “Thanks!!!! !” to Carol Bailey, Tess, Moore, Mary Virginia Gibbs, Justin Adkins, Deborah Pohlman, Bravo-Live DJ, and the many, many, many people who tirelessly contribute to this event with total class and enthusiasm! If you have not yet spent a day at The Huntington Museum of Art, I highly encourage you to do so soon! A few of my favorite highlights – Cheers!!! !